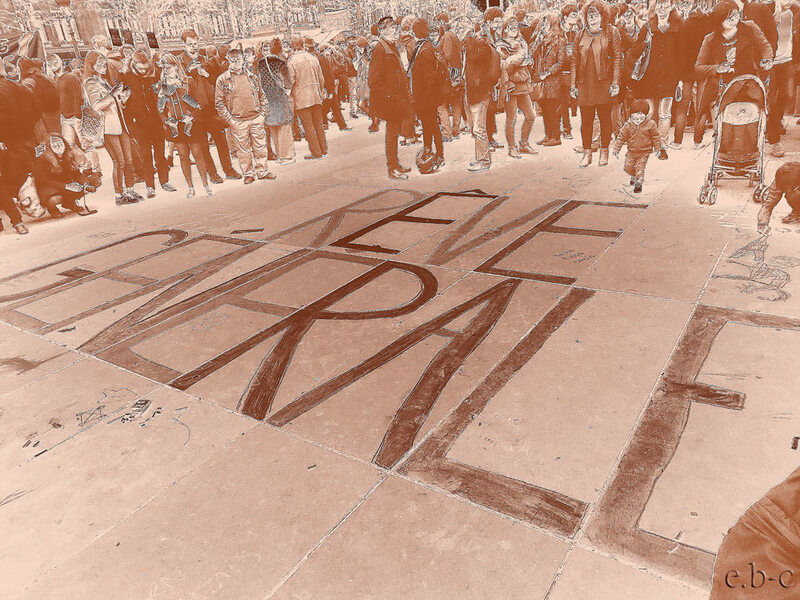 We share below an article by David Graeber on Nuit Debout originally published in Le Monde, (12/04/2016) and shared on blog.gmane.org/gmane.culture.internet.nettime . What we have been seeing in the news, this week, with the juxtaposition of the Panama paper revelations, and the emergence of Nuit Debout in the streets of Paris and other French cities, is the struggle between two different forms of solidarity, two global cultures—the first, all too developed, the second, still in the process of being born. The first is the solidarity of the wealthy and powerful, or, more precisely, those whose wealth is founded on their power; the other, is the emergence of new forms of revolutionary democracy that are taking, increasingly, planetary form. Each relies on creating spaces outside the formal structure of the state. What we are beginning to see, with the police show of force last night, was just how differently the “forces of law” react to each. What the Panama papers reveal above all is a global political class whose ultimate loyalty is to each other. Nawaz Sharif, Robert Mugabe, Vladimir Putin, or David Cameron…. however much such men might glower at each other across the world stage, when it comes to what’s really important to them as human beings (the financial security of their children, for example) they show a remarkable degree of solidarity. This is, of course, in dramatic contrast to how they feel about the safety and security of the children of pretty much everybody else—other, of course, than members of their only real constituency: the other members of the global %1. Still, for anyone familiar with how wealth is really accumulated in today’s world, there is still something genuinely puzzling in these revelations: why is it so important to these people not to pay taxes to begin with? This is less obvious than it seems. As the wealth of the ruling classes comes to be based increasingly on financial speculation, we are no longer talking about protecting the profits of commerce and industry from the grasping hands of the state; almost all these fortunes are based on collusion with state power to begin with. If your income is based on control of the levers of power, why squirrel it away in Panama? Would it not be just as easy to extract twice as much, and then ostentatiously hand half the proceeds back again as gesture of loyalty? It’s hard to escape the conclusion that a gesture of loyalty to the nation-state is precisely what such men are trying to avoid. The creation of these tax shelters is the creation, not precisely of a state of sovereign exception, but of one of financial exception, within an emerging global legal-bureaucratic order of which the beneficiaries, themselves, the architects. The creation of this order is probably the most important historical phenomenon of the last two generations. Never before has the planet seen anything like it, a unified administrative system. What was the alter-globalization movement of the turn of the millennium, after all, than the first social rebellion against this emerging planetary bureaucratic system? As a participant in some of its most notorious battles—in Washington, Quebec City, Genoa—I can attest this is exactly how we saw ourselves. What was being billed as “globalization,” as a kind of natural and inevitable process driven by “free trade” and the internet, was really created and maintained of endless grey functionaries, working for bureaucracies public and private, or even more, in an indistinguishable grey zone in between: the IMF, WTO, TTIP, Goldman Sachs, Credit Suisse, Standard & Poors, or Bechtel, with the ultimate purpose of maintaining the wealth and power of a tiny elite. What we’ve now learned is just how much members of that elite considered it a point of principle that those with the power to impose laws on the rest of the world should not be bound by laws themselves. How to fight an anti-democratic enemy that stood outside of any national, political order? Our solution was to create democratic spaces that stood outside the legal and political order as well: prefigurative spaces, as we liked to call them, which also became zones of experiment in leaderless direct democracy. These new forms of democracy were not, exclusively or even primarily, products of Europe or North America; they were, as we liked to call it, part of new insurgent civilization, planetary in its scope and ambitions, born of a long convergence of such experiments carried out in every part of the planet, from the forests of Chiapas and Brazil to the villages of Karnataka in India, squats from Lisbon to Quito, with substantial inputs from feminism, anarchism, and traditions of non-violent civil disobedience; a repertoire of terms, tactics, gestures, endlessly nurtured and elaborated in thousand local variations, that was to explode in public squares across the world a decade later, from Tahrir to Syntagma to Zuccotti Park. The great historical sociologist Immanuel Wallerstein once made the argument that every real revolution is a world revolution. In some the street battles were all in one place (1789, 1917) in others (1848, 1968) dispersed across the globe, but in either case, it was the world system itself that was transformed. Above all, this took the form of a deep transformation in political common sense. In this sense the French revolution of 1789 really was the quintessential modern revolution because its effects in this respect were the most radical. If twenty years before the storming of the Bastille, one were to propose to the average person that, say, social change is good, that it is the role of the state to manage such change, or that government earns its legitimacy from some entity called “the people,” one would most likely have been written off as an café-dwelling dilettante or rabble-rouser. Twenty years after the revolution, even the most stuffy cleric or headmaster had to at least pay lip service to such ideas. And what then, of what Wallerstein is already calling “the world revolution of 2011?” No doubt it will take many years to appreciate its true historical significance. But there is a real possibility future historians will see it as marking another profound shift in popular conceptions of what a revolutionary, or indeed, democratic, movement even is. Mainstream pundits and Marxist theorists alike never tire of declaring the failure of the movements of 2011, but if Turkey, Brazil, Bosnia, Hong Kong—and now, France—are anything to go by, they have permanently changed the very language of popular democracy. In every case, popular uprisings no longer take the form either of armed revolution, or attempts to transform the system from within; the first move is always to create a territory outside the system entirely, if possible, outside the legal order of the state: a prefigurative space in which new forms of direct democracy could be imagined. The refusal to engage with the existing political order does not mean such movements do not aim to have legislative effects. But they mean to do so not by courting or even, for that matter, denouncing politicians, but by threatening them with the prospect of utter delegitimation. This is what has happened in France. The organizers of the original march against the new Labor Laws were planning a single day’s event. But things almost immediately escaped their control. A kind of mass outpouring of the democratic imagination ensued; libraries, gardens, popular education centers, kitchens, studios, appeared; thousands taking part in general assemblies began cheerfully adopting, and in the process, creating their own idiosyncratic version of the new global language of direct democracy. Hundreds of thousands followed, and contributed, on social media. As veteran activists from around the world—myself included—hurried to Paris to lend their experience with process, wild new demands began to be formulated (debt cancellation, citizens income, sortition…) that had hitherto been completely excluded from “serious” political debate. As the process threatens to expand, next, to the immigrant and working class suburbs, the initial contemptuous dismissal of the political classes seem to be turning into a kind of panic, and more and more men with weapons have come to surround the new agora, as if to literally prevent democracy from overflowing its bounds. The traditional justification for spaces of exception is that they can become places of creativity: after all, only those who are not bound by the existing legal order can create new laws. But it’s increasingly difficult to imagine any solutions to the world’s most pressing problems coming from that space of financial exception in which the world’s economic and political elites now live. About the only kind of imagination that has come out of it has been the design of ingenious new financial instruments. Yet at the same time, millions of humans beings who do not have access to such an extra-territorial space, full of potential ideas and solutions, live lives which consist of little more than being constantly told to shut up and keep working. If we are ever to think our way out of our endless current logjams, it can only come from the new extra-territorial spaces—if not legally extra-territorial in this case, then certainly, morally and politically so—that the world revolution of 2011 began to open up. As Nuit Debout spreads and multiplies in neighbourhoods and cities across france, and as it endeavours to reach out to work places, in an expanding convergence of struggles, it is difficult to follow all that is unfolding from a distance. The french language site Reporterre maintains an regularly updated list of websites and electronic addresses of Nuit Debout activity. Poem dedicated to the youth looking for hope and freedom… Breathe ! This entry was posted in Commentary and tagged David Graeber, france, Nuit Debout, Panama Papers. Bookmark the permalink.